In the blink of an eye, our two-month South American journey came to a close. Our time down there was magical, and we feel so grateful to have done it. The last country we visited in South America was Argentina. And boy, it did not disappoint. Read below to know our stories of fighting off food-stealing animals, riding through the 9 Levels of Hell, learning Tango and hunting for fossils. And, keep an eye out for our upcoming post on the story of Evita, Argentina’s most interesting and polarizing figure, whose story is so interesting and outrageous that we decided to write it a blogpost of its own. 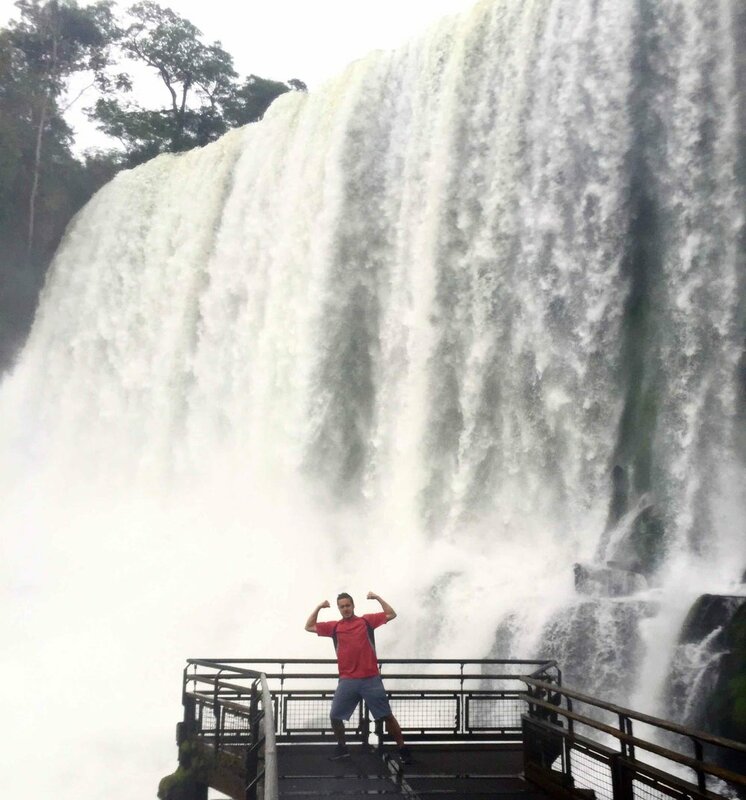 The sights, sounds, size and sheer power of Iguazu Falls are mind-blowing to an indescribable level. More than 13,000 cubic meters flow through each second, making Iguazu the largest system of waterfalls in existence and earning it the distinction of being one of the 7 Natural Wonders of the World. 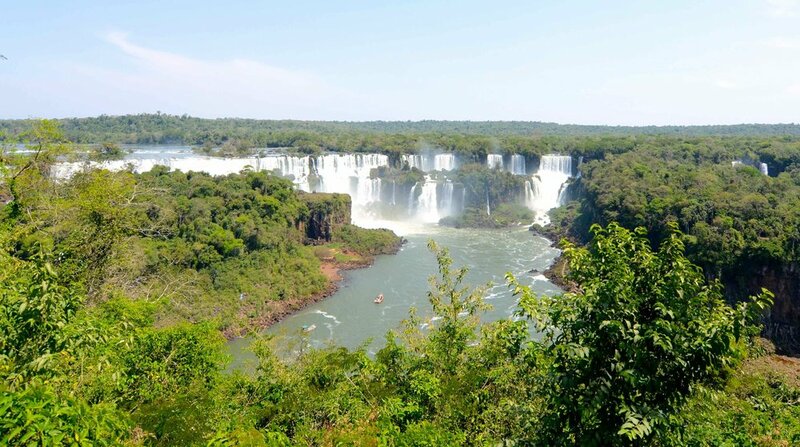 The falls straddle the Brazil/Argentina border, and we were encouraged to visit both sides for a complete experience. 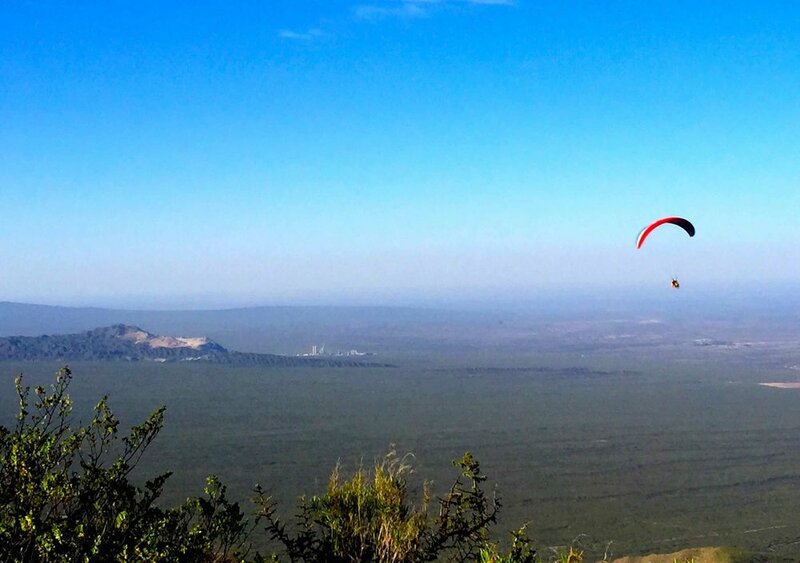 Whereas the Brazilian side offers panoramic views from afar, the Argentinean side brings you up-close and personal, letting you experience them from above and below, feeling the mist on your face as you wander along. We visited the Brazilian side on Day 1. The Brazil park makes the visit quick, relaxed and organized. After a quick visit to a beautiful park full of exotic birds, a Disneyland-like bus picks you up at the entrance and drops you off right at the first viewpoint. We were immediately in awe of what we saw: waterfall after waterfall across our entire field of view. It turns out that was just the beginning: as you keep walking along the path, even more falls come into view. With over 275 falls in the system, it was unlike anything we’d ever seen. We’ll be honest: a couple of tears were shed as we looked around, feeing overwhelmed by the size and beauty of it all as rainbows glistened in the mist. The Argentina park, which we visited on Day 2, is much larger in contrast, with miles of trails that allow you to experience the falls from every possible angle: above, sideways or even below. 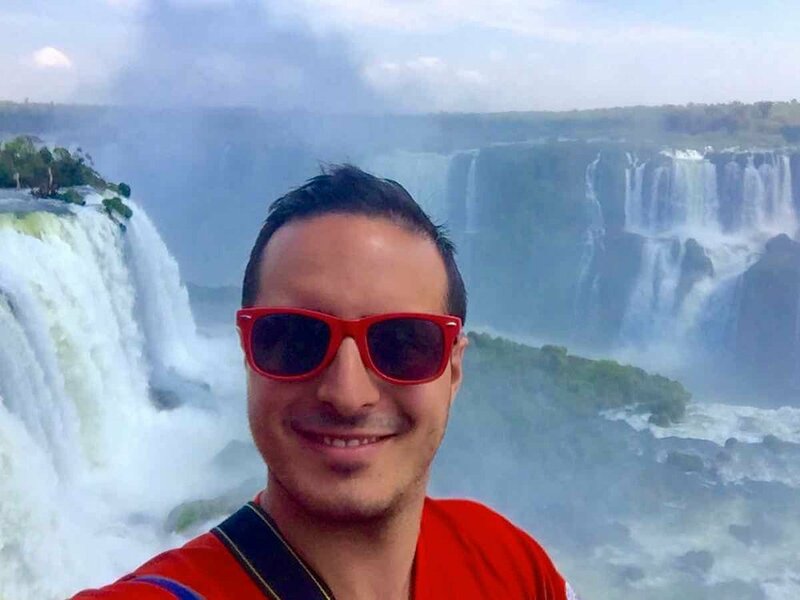 We trekked over the Parana River to a deck that overlooks the “Garganta del Diablo” (The Devil’s Throat, the biggest waterfall in the system), feeling our bodies reverberate with the sound of millions of gallons of water crashing below us. We then took a boat ride into the falls themselves (smaller but faster than Niagara’s 'Maid of the Mist’), where we got soaked despite having brought ponchos. We ended the day sitting for an hour at one of our favorite viewpoints, just staring at dozens of falls in amazement, feeling small against the majesty of Mother Nature. Even thought this didn’t really fit into the story, we couldn’t leave this part out 😛. One of the most amusing parts of visiting Iguazu was being greeted by a slew of small, raccoon-like animals called “coatis.” They are EVERYWHERE, and made us feel simultaneously amused and on alert. From the moment you enter, you are warned not to feed them, and to keep any food you are carrying tightly sealed inside your backpacks. Always shameless and sneaky, coatis are known for aggressively stealing food from park visitors, something we saw firsthand when we had to scare off a handful of them that started chasing us around as we were eating our sandwiches. While sitting next to us, a teenage girl pulled a plastic bag from her backpack, prompting one coati to rip it off her hands and at least 25 others to immediately run in, ripping the bag to shreds to get a bite of the food inside while the girl stood there helplessly watching. We also found it particularly funny when we saw an older American gentleman jump in fear as he attempted to throw away a bottle at the same time a hungry coati popped out of a trashcan. If you are American and have heard of Mendoza before, there’s one assumption we can safely make about you, and that’s that you enjoy a particularly fruity, complex, delicious thing called… wine. 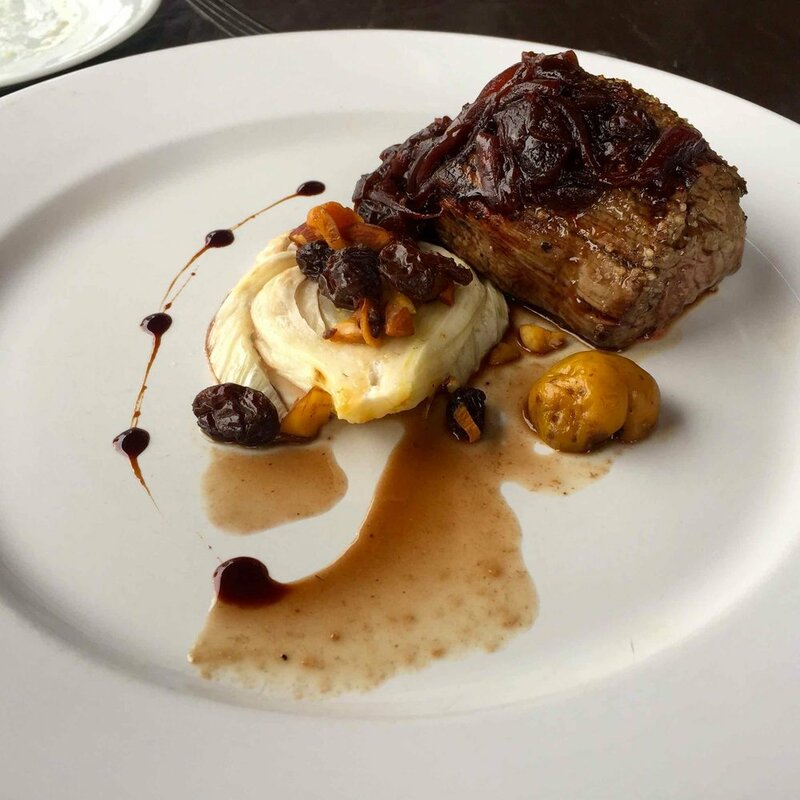 That’s why when planning our Argentinean trip, Mendoza was a “must visit” stop. Located near the Andes west of the country, this area sends over a billion liters a year to thirsty fans around the world. And although the region is mostly known for its award-winning, deep red Malbecs, just about every wine variety is grown there. We arranged a tour to the Uco Valley, an up-and-coming region in the shadow of the Andes mountains where high-altitude wines are grown. Grape production in this area only began in earnest in the 1990’s because the land isn’t quite friendly to grape vines. Softball-sized hail falls frequently during the winter, something that can easily destroy a farmer’s entire crop. This has led to some interesting vine-protection solutions, including Kevlar nets and bombs shot into the air to break up the ice. You read right. The grapes are protected by bombs and Kevlar. Why then, would they choose to plant here? Aside from the 250 days of sun and the fertile soil, apparently high altitude = better wine. Grapes grown at higher altitudes have more concentrated flavor (something about lower temperatures and stronger sun rays). 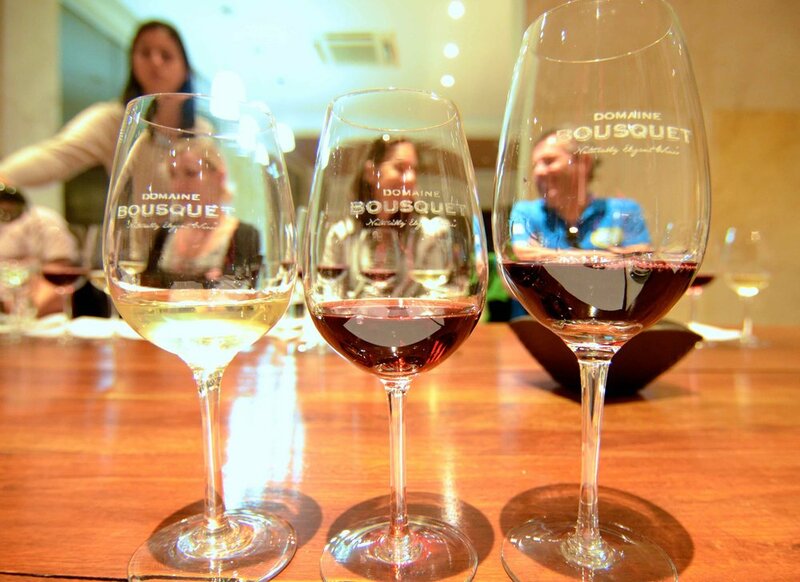 All of that comes together in the art and science of winemaking to produce unique, delicious varieties of Malbec, Cabernet Sauvignon and others. We saw the winemaking process in action at the three beautiful wineries we visited: a small organic winery started by a Frenchman, an industrial-sized winery which doubled as an art museum, and a small culinary-oriented winery where we delighted in a six-course food and wine tasting. Suffice it to say we enjoyed ourselves and took a nap on the bus ride home 😛. 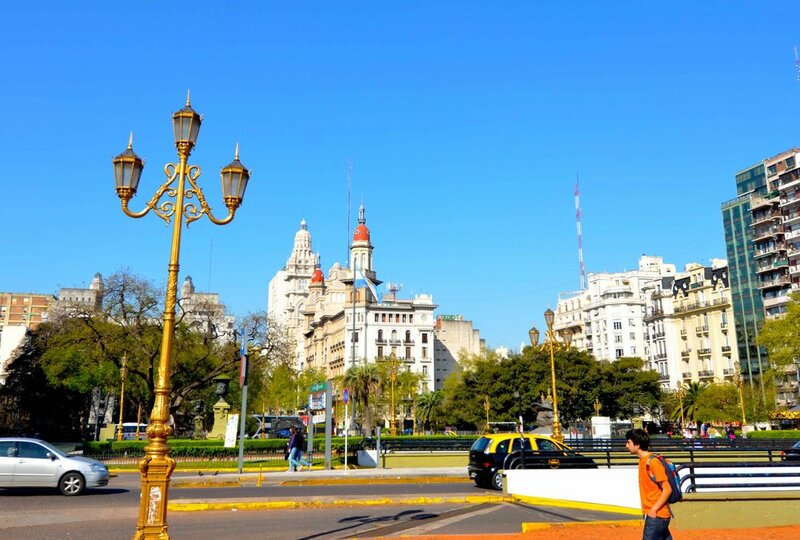 Out of all the cities that we visited in South America, Buenos Aires was undoubtedly the most culturally rich. 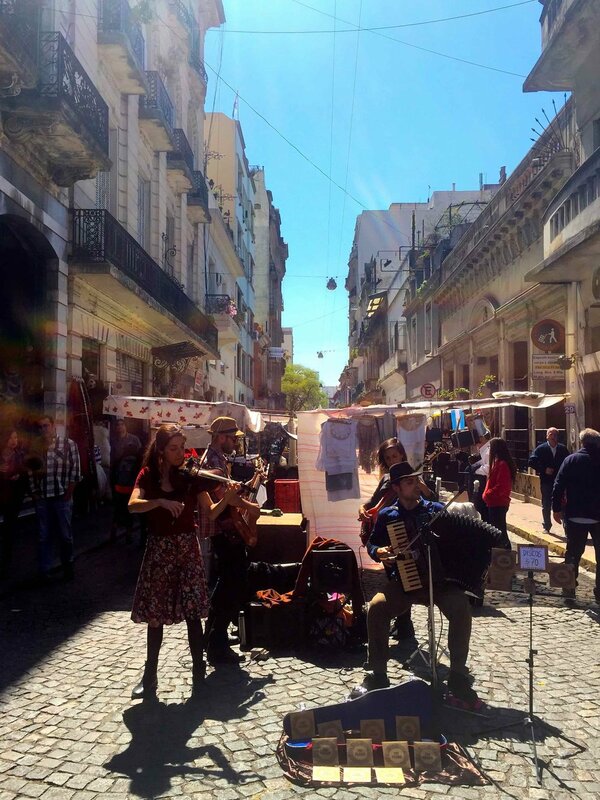 Every day, everywhere, we found ourselves surrounded by music, art, theater, film, architecture and dance. So how did we decide to become embedded in this cultural richness? Well, by learning to tango, of course. Contrary to popular belief, Tango is not just walking back and forth close together with a rose in one’s mouth. In fact, the dance is very complex and requires a deep connection between partners who must move in almost perfect unison as they glide across the floor. The man will usually lead, as most of the time the woman is moving backwards and can’t see what’s coming. 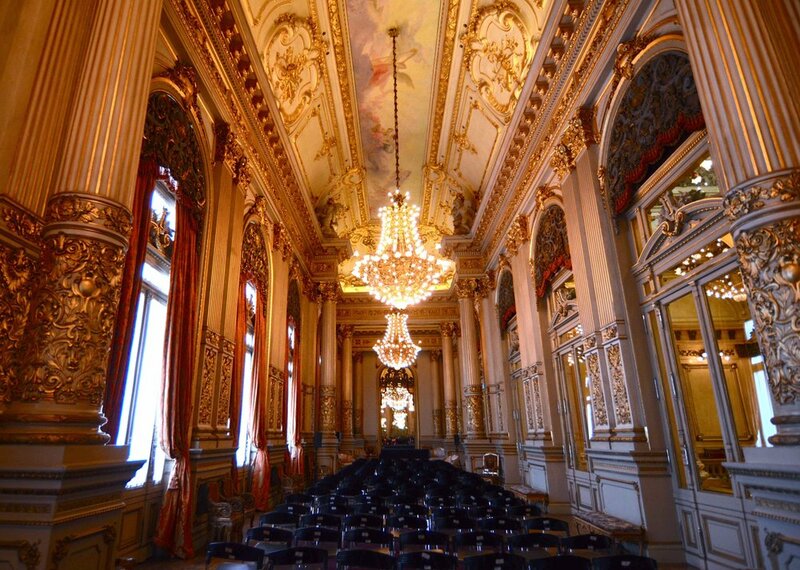 Buenos Aires is full of “bodegas”—houses of tango. 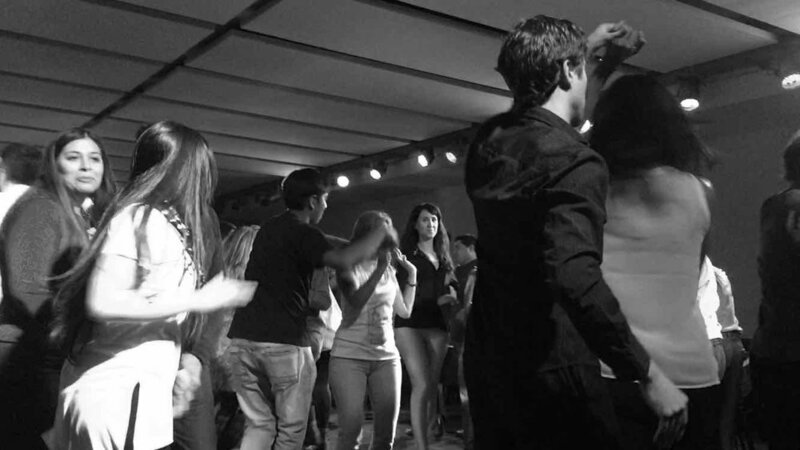 Most around 10:00 pm, and many of them hold classes in those first couple hours to cater to tango virgins like ourselves. We partook in one of these classes learning Tango’s seven basic steps. 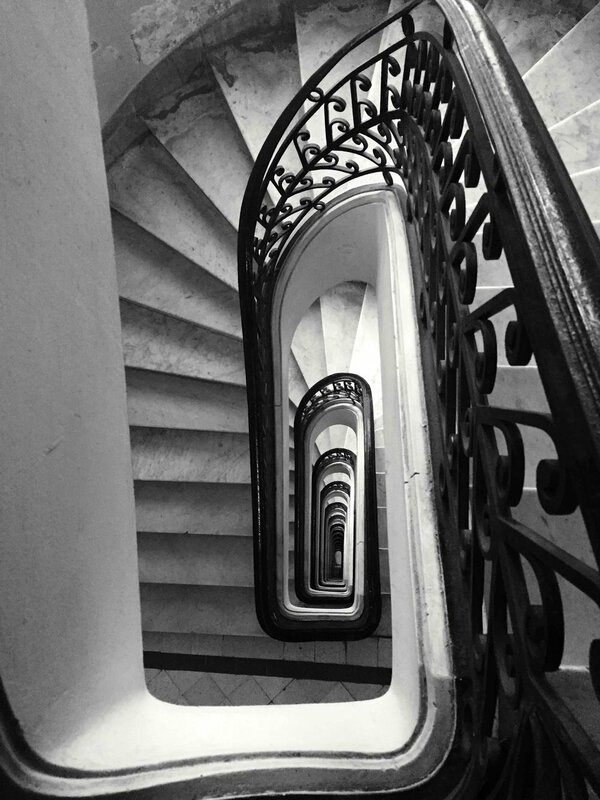 The steps were easy enough, but moving in sync with each other gracefully was freaking hard. I found it nearly impossible to follow the lead of another person and with both Rolando and I directing we not only looked like awkward robots in need of oil but ran into the tango novices dancing around us. Seeing the more experienced woman dancers closing their eyes, I followed suit and quickly found that it helped me let go and follow the movements of Rolando’s body. By the end of the class we were proud we got the basics down and learned a new skill. Around midnight the party really started as the experienced Tango dancers filtered in. We had a seat right in front of the dance floor and were floored by the grace and skill of the dancers we saw. They weren’t professional dancers, just normal people out for a fun night, but they put on a wonderful show. 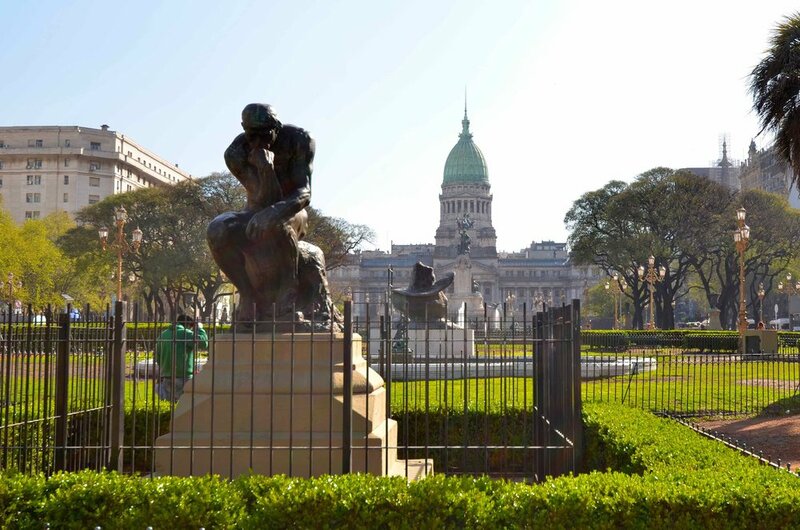 The capital of Argentina is known as “The Paris of the South.” One reason for this is the immense cultural richness we mentioned above. However, it also owes that title to its (very much intentional) French-style architecture. 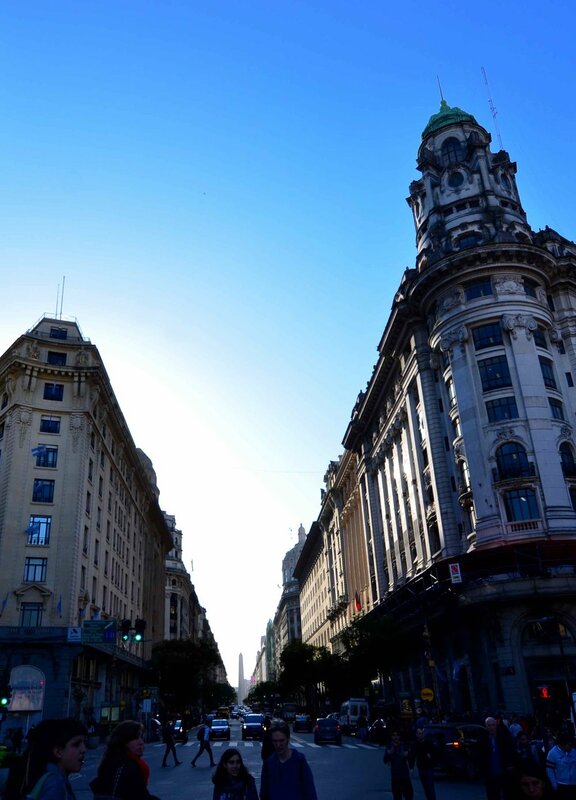 Interestingly, Argentina was one of the ten largest economies in the world in the early 20th Century. Exports of livestock and grain brought them economic power, and staying neutral during both World Wars allowed them to be one of the largest providers of food for the fighting superpowers of the time. At this time, many wealthy Argentinians self-identified as European, even if they were born and raised in the Americas. Realizing their own importance on the world stage, they decided to celebrate the 100th birthday of Argentina by scrapping most existing construction and start fresh. Almost all Spanish colonial architecture was torn down and new Parisian-style mansions, buildings, and cultural sanctuaries were built. Since that time, other architectural styles have sprouted up across the city—neoclassical, art nouveau, modern, etc.—making every street an eclectic mishmash of building styles. One building that stands out is the Barolo Palace. Despite its beautiful exterior, the story and inspiration behind the design is even more interesting: it was designed to portray Heaven, Purgatory, and the 9 Levels of Hell. Back in WWII there was real concern that Europe would never again rise to its pre-war glory. Luis Barolo, a wealthy entrepreneur and enthusiast of Dante Aligheri’s “Divine Comedy,” decided to design a European-style building celebrating the work he so loved. The 100-meter-tall building was constructed with an incredible mix of Masonic symbology and references to the Divine Comedy itself. For example, it was divided into 22 floors representing the 22 stanzas of the poem and three parts symbolizing Hell, Purgatory, and Heaven. Nine arches in the main entrance hall represent the nine circles of Hell. After walking up and down through Purgatory (something that happens in the narrative of the Divine Comedy itself), you take a narrow flight of stairs to arrive at a working lighthouse on the top, which overlooks the entire city and represents your arrival to Heaven. The best (and most amusing) part? The offices of the building, which represent the 9 circles of Hell—and we are not making this up—, are almost entirely occupied by lawyers. Another cool experience involved a prohibition-era-style bar called Frank’s. Here’s how it worked: we wandered into a residential area, with nothing but an address to go on. When we arrived, it didn’t not look like much—just a regular house with a black garage door. We knocked on the door and a small gate opened, asking for the secret password. We said a friend (our Airbnb host Ari) had sent us, and they let us in. We were then directed inside of a phone booth, and given a phone number to dial on the keypad. Once we dialed it, a secret door opened, uncovering a glamorous, 1930-style bar with classy people drinking gourmet martinis. A unique experience, to say the least! Ischigualasto. Try saying that three times fast. 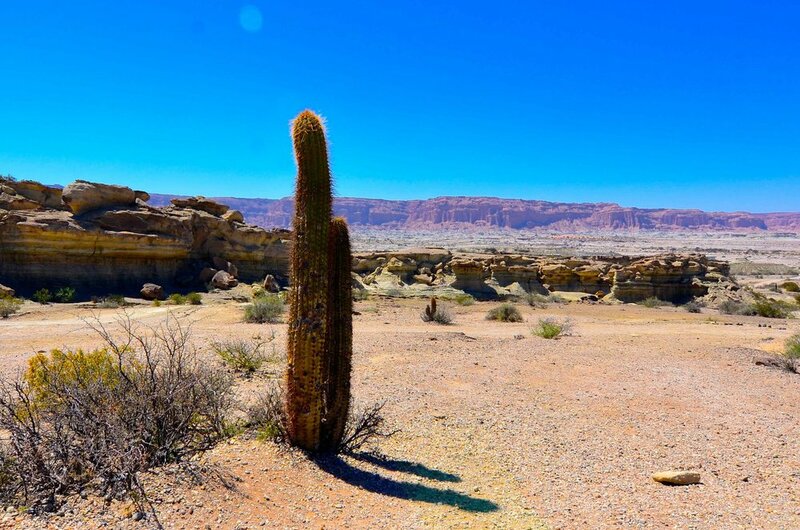 Also known as “The Valley of the Moon,” Ischigualasto wasn’t on our radar until we found ourselves with a couple extra days in the Mendoza area. However, a quick Google search of what the park had in store quickly solidified our decision to visit. 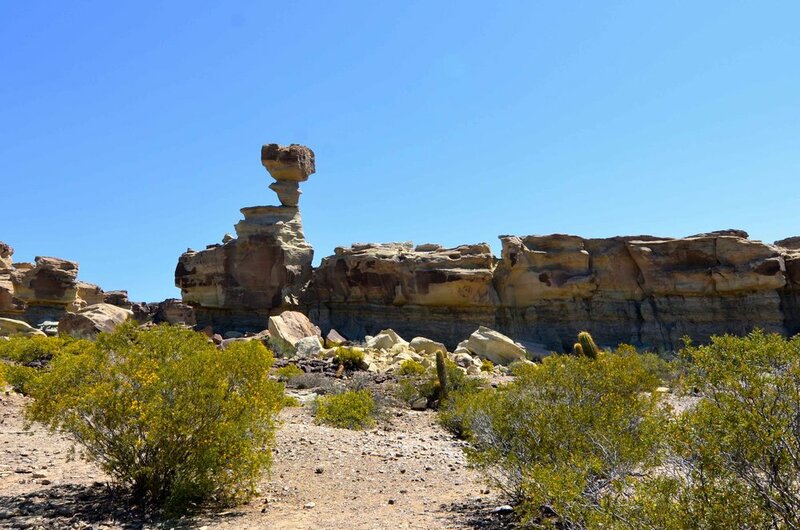 There are two main draws to Ischigualasto (which means “land with no life”): the odd lunar-looking rock formations, and the dinosaur bones (OMG!). It’s an immensely important paleontological site. 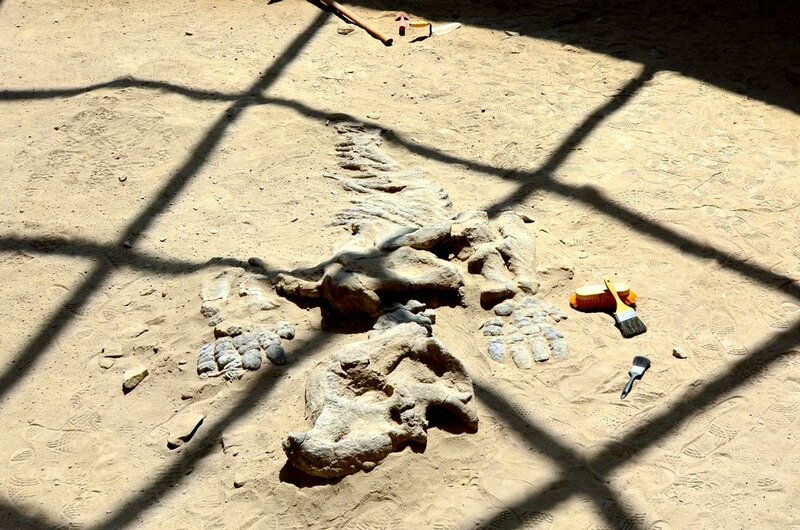 The world’s oldest dinosaur fossils, some 200-250 million years old, have been found here. The Triassic-era fossils have been found in rare complete condition and many have been preserved as complete skeletons. Studying this region has therefore helped scientists learn a great deal about the first dinosaurs, shedding light on how they interacted with mammals and the plant life in their surroundings. The park has a few museums discussing the history of the zone and which display countless fossils of the dinosaurs and ancient mammals that lived in the area. Rolando was in Dino Heaven. Once lush with trees and swamps, the area is a bone-dry, 90-plus-degree desert. The once-flowing water, volcanos, and seismic activity contributed to the amazing and baffling rock formations now found in the park. 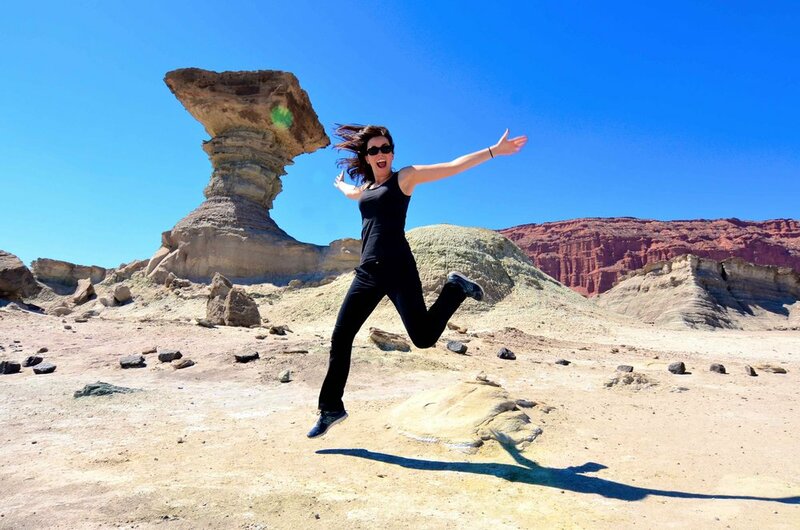 The tour took us through ‘painted mountains’, fields of naturally-formed rock spheres, and countless gravity-defying rock formations. It’s astonishing to think that two months have passed since we started our journey. 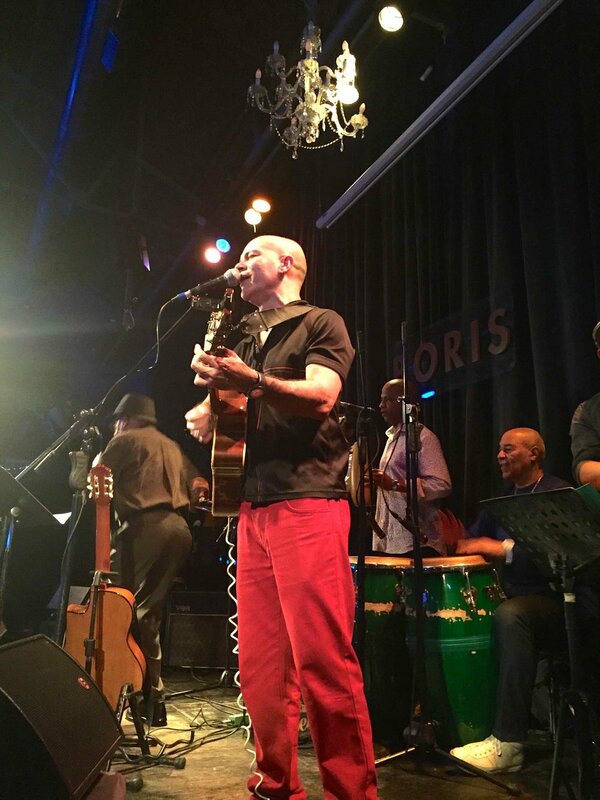 We said goodbye to South America, and continue our trek through North America. Thank you for reading, stay tuned for more! We’d love to know your thoughts! What questions do you have for us? Is there anything in particular you’d like us to write about? Maybe you want to have more travel tips, or how to plan a long-term trip, or want to know more about a particular country. Either way, leave a comment below or write us on our Facebook page. Thanks!